Light Beam for precision blasting - even in the dark! Blast at target from up to 35 feet away! LINE UP THE LIGHT BEAM ON THE TARGET FROM 15 FEET AWAY! Includes 3 MICRO DARTS and target with stand Requires 2 "AA" batteries (not included). The NERF NITE FINDER blaster takes your blasting to a whole new environment -- the DARK! 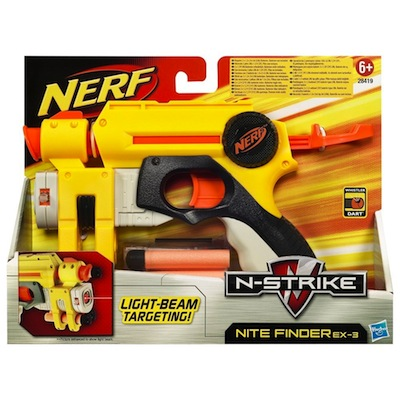 Step into the night and bring your NITE FINDER blaster with you for some high precision target practice! Line up the red light beam on your target and READY. . . AIM. . . FIRE! See how your blasting skills measure up, day or night. Get the right refills! CAUTION: Do not aim at eyes or face. To avoid injury, use only darts designed for this product. Do not modify darts or dart blaster. PRODUCT COLORS MAY VARY!